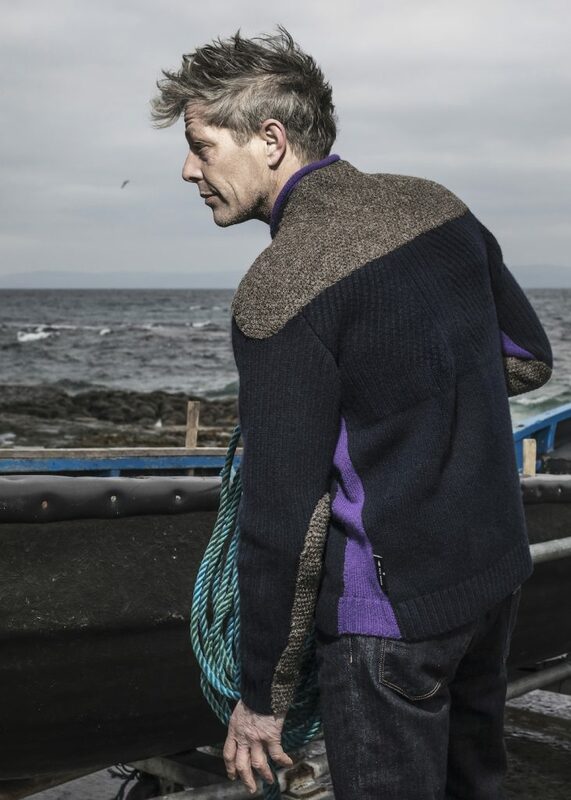 Fisherman’s Sweater | Inis Meáin Knitting Co. The tradition of the Aran workwear sweater where island women folk knited sweaters for their fishermen husbands and family is well known. For this collection Inis Meáin challenged Lucy Downes of Sphere One, a modern knit design label, to come up with a new Aran. While the intricate cabling of traditional Aran has been often copied, she felt that what made the original Aran so special was caring aspect of making a piece of clothing for a loved one, to provide warmth, protection and comfort, knowing their needs out fishing. Sphere One focused on what Inis Meáin could do today to advance the comfort that a knitter in the 1950’s might not have been able to achieve. The piece, technically challenging to knit and construct, is a truly original new Aran befitting a hard-working fisherman today. The result is a high back neck, not a hoodie, which would restrict critical visibility, lined with cashmere for warmth at an exposed area.